'To Be A Pilgrim' is a new DVD from Saint Anthony Communications, the Catholic Media company which has produced other wonderful films such as Faith of our Fathers and Lead kindly light. 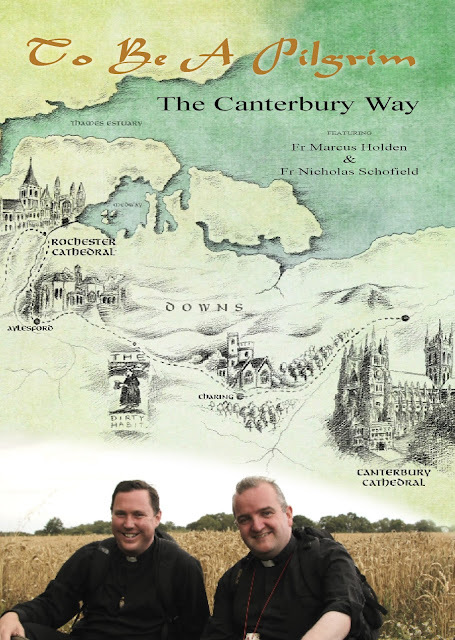 In their latest collaboration, Fr Marcus Holden and Fr Nicholas Schofield walk to Canterbury, visiting several medieval Catholic treasures along the route. An ancient trail of pilgrimage runs through south-east England; a pathway along which so much of English identity converges. It is the way of St Thomas Becket, the martyr who stood up to a King and inspired Christendom. It is a route that drew countless pilgrims in ages past, captured the imagination of Chaucer and is reviving in our own times. This film follows Fr Marcus Holden and Fr Nicholas Schofield as they journey from London to Canterbury. Along the way they discover the story of St Thomas and some fascinating traditions: the Rood of Boxley, the splendour of Rochester, the 'second Carmel' at Aylesford and many more.